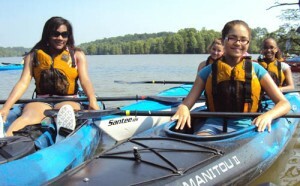 On June 20, 2012, Wild River Outfitters, Virginia Beach SPCA, and local churches partnered with the National Park Service – Rivers, Trails, and Conservation Assistance Program (RTCA), to provide 12 local youth with the opportunity to learn about and explore local waterways by kayak. 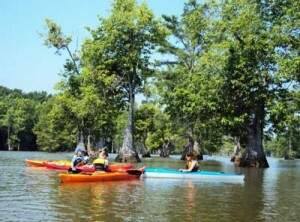 After an orientation to basic paddling skills and boating safety, the group went on a 3-hour paddle trip accompanied by guides that shared information on local wildlife, habitat, and watershed health. The paddle trip was followed by lunch and a walk with a local naturalist at Stumpy Lake Natural Area. When asked what they liked best about the day, some of the responses were: seeing the white bird, and trees in the water; getting the feel of the paddle and the boat;getting to paddle through the trees like an obstacle course; spending time on the water and meeting new people;learning about my local watershed and what’s in my own backyard (that is what’s best about today); and seeing the kingfisher. 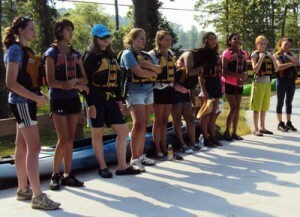 When asked what they learned on the tour, some of the youth responses were: eagles live up to 25 years in captivity; how to paddle and turn a kayak; osprey talons do not lock when catching fish; falcons are the fastest of birds; this is a part of a larger body of water, you could theoretically paddle to the Atlantic Ocean and down to Key West. The Youth Paddle Tour demonstrated a practical, community-based, approach to address the growing health concerns of inadequate physical activity among youth, by engaging them in fun and relevant outdoor recreation and environmental stewardship activities. In addition, the paddle tour promotes teamwork, confidence, self-esteem, civic pride and awareness of local heritage and watershed resources. Located at the headwaters of North Landing River, the Stumpy Lake Natural Area served as the venue for the event. The 1,422-acre property, acquired in 2001 from the City of Norfolk, is located along the south central Virginia City boundary with Chesapeake. The 278-acre lake is accessible via an ADA compliant canoe/kayak launch and overlook. Approximately 970+ acres of undeveloped, forestland surrounds the lake, with close to 2 miles of trails, providing opportunities for hiking, fishing, bird-watching, nature observation and photography. Courtesy of the NPS – Rivers, Trails, and Conservation Assistance Program.